I can’t remember not being horse crazy, but I grew up in suburban New Jersey where opportunities to be around horses were few. However, there was a local stable and my parents acquiesced to letting me take weekly riding lessons. 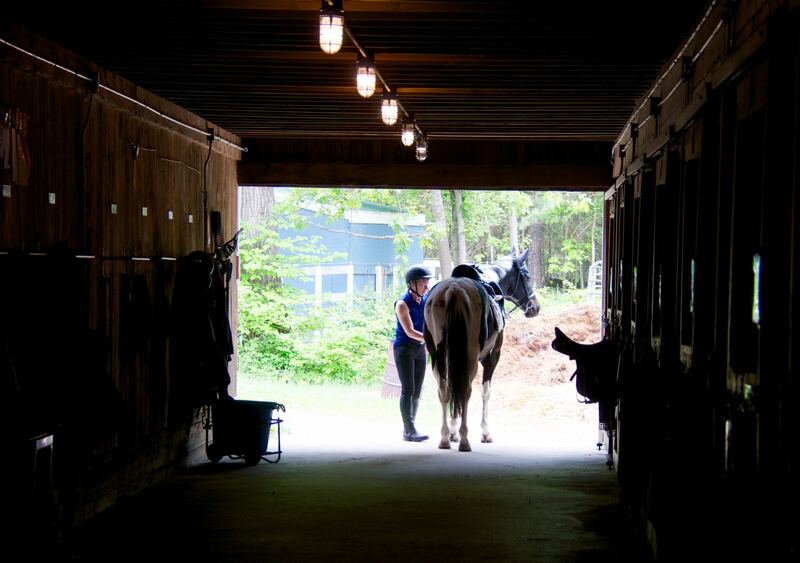 In my teens, I went to summer riding camps, where I learned dressage and eventing. At the age of 16, I attended the Talland School of Equitation in England, where I discovered the satisfaction that comes from a perfectly groomed horse. Also while there I was exposed to the pinnacle of dressage – the owner of the stable was a Grand Prix dressage rider and international judge. While at the school I passed the B Pony Club exam. Back in the States, I bought a young gelding, worked on horse farms in the summers, and attended UNH from which I graduated with a degree in animal science. After college I had jobs in the horse industry, bought a mare that I brought up to second level, and lessoned with Louise Nathhorst (who would later get a bronze in the Olympics) and Jessica Ransehousen (also an Olympian). By my thirties I had changed careers, became a food writer, married and had children. When I could, I would lease a horse. In the meanwhile, I had a dog that needed to stay busy and so got into agility. Through that I found my way to clicker training. Fifteen years ago, my path crossed with that of Karen Pryor (the scientist and writer who brought positive reinforcement into the public consciousness) and we have been firm friends ever since. Karen and I have had many conversations about training theory. How I work with animals has been informed by her wisdom, and she always keeps me true to the science behind the methodology. I also have taken formal course work. In 2015 I graduated from the KPA Professional Training course, with distinction. In 2013 I was able to return to horse ownership, and bought a 14.3 hh American Paint gelding named Tonka. I selected him for his kind eye, not his dressage ability! He and I lesson with Grand Prix rider Kim Litwinczak. My goal with Tonka is to reach second level in a happy frame of mind and body. To do this, I use my thorough understanding of classical training, but always with an the overarching perspective of positive reinforcement. My training methods are already paying off – in our first year of showing we came in first or second in each of our ten classes. We closed out our second season ranked first in the country in the USDF Vintage Cup All-Breeds Awards for Paint Horses. However, it’s not all about ring work. Tonka and I spend much time out on the trails. I am back to being a horse professional. My forte is dressage, but I work with all disciplines. I bring a problem-solving, non-confrontational approach to reaching your goal, whether it’s a flowing dressage test, or a horse that is a pleasure to ride on the trails. I also do behavioral consultations and can help with such issues as needle phobia and refusing to load into a trailer. I am based in eastern Massachusetts and drive throughout New England to meet with clients at their barns. I am available for Skype and email consults, and I’ll travel further afield to teach clinics.